Delivery isn’t the only way to get your online shopping. When you use Click & Collect, there’s no need to wait at home all day and no need to spend on delivery costs. Just pick up your package at your nearest The SM Store— all free and super convenient. When you choose Click & Collect during online check out, we’ll ready your package at the store you request. •	Shop with us at shop.sm.com . •	Wait to be notified via SMS once your package is ready for pick up. We’ll aim to get it ready within 24 hours. 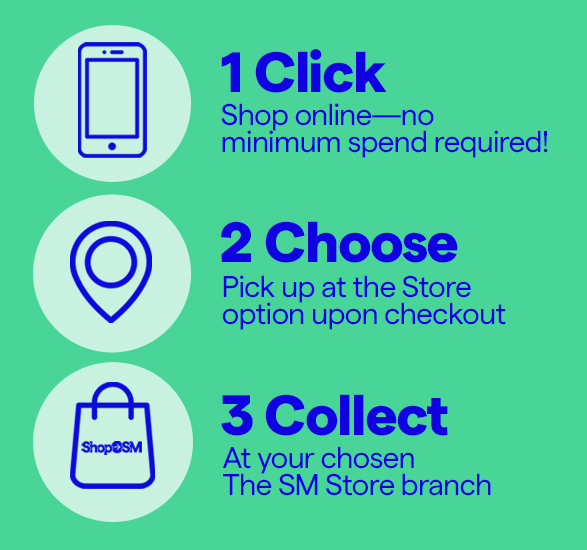 •	Go to your chosen The SM Store whenever convenient. (We’re usually open until 9pm, so you can come by after work. Call our hotline 811-0000 if you have any questions about your package! •	Head to the dedicated Click & Collect counter and present your SMS notification. When you can’t get your mom to wait at home for your parcel of lipstick, Click & Collect might just be the best thing. Get it when you want and get it fast. Just Click & Collect! Enter a term in the search bar above to find articles or click 'Live Chat' button below to chat with one of our agents.